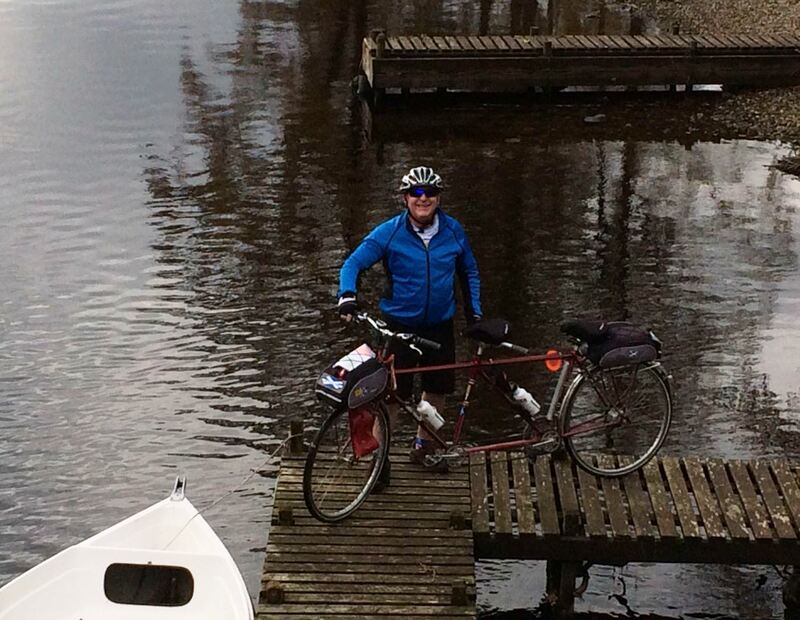 Picture postcard Loch Earn – with the added attraction of me on a jetty! Reveille on Sunday morning at 7.30 am. The “old gal” muttered: “You can’t be serious!” But the “old git” was a man on a mission! And despite the gloomy low cloud and drizzle outside at Matildas Rest in Perthshire, the “old gal” was persuaded that it was dry and sunny at today’s venue of Loch Earn. 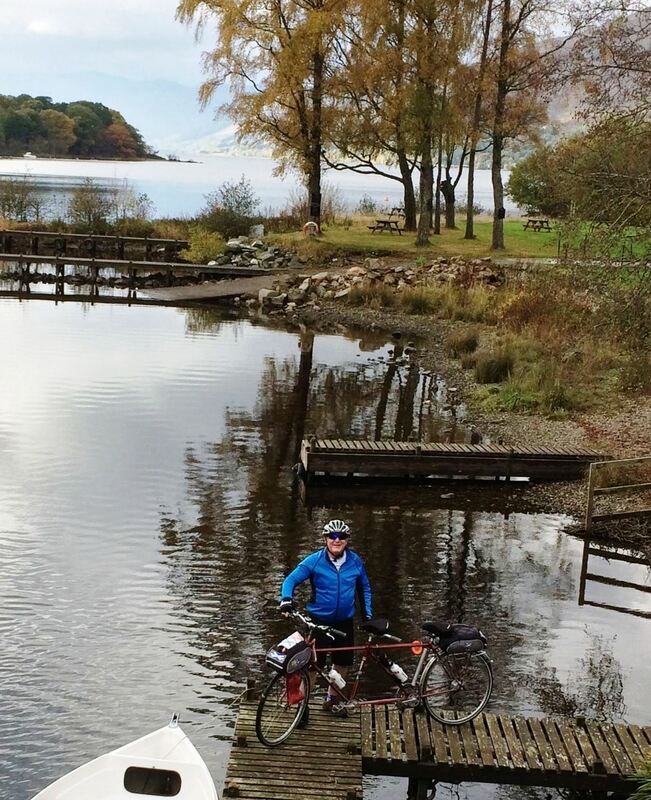 The route appealed because it is a naturally beautiful area within the Loch Lomond & Trossachs National Park – with a relatively easy 16 mile loop round the loch – which is only about a 40 minute drive by car through Crieff and Comrie. Despite it being so close, it was new territory for Team Matilda. Now my dynamic duo – and me – always like new areas. But believe it or not, we were recommended to try it by my good tandem friend Bluebird – and her crew John and Jane, who live almost 500 miles away outside Southampton! How did this happen? 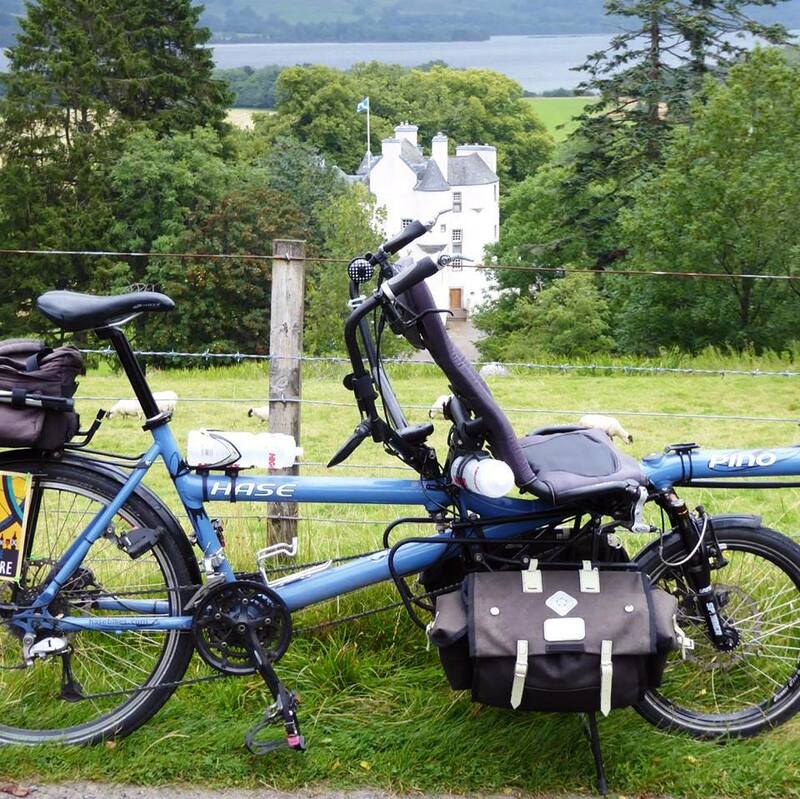 Well John and Jane really enjoyed their Travels with Bluebird tandem trip to Loch Earn on a day when Team Matilda couldn’t be with them during our joint Le Tour de Perthshire du Tandem back in August … and said we needed to try it. Now the “old git” is known to do a bit of research – in fact the “old gal” swears his middle name is google! – but often it pays off. And in his mission to familiarise himself with the new route he discovered the added attraction of a new art trail linking locations within the National Park area. The unique BLiSS Trail links the villages of Balquidder, Lochearnhead, Strathyre and St Fillans – deep in the heart of Rob Roy Country. The trail – made up of a series of ornamental metal and wood sculptures mostly by various artists – commemorates the Year of Innovation, Architecture and Design. 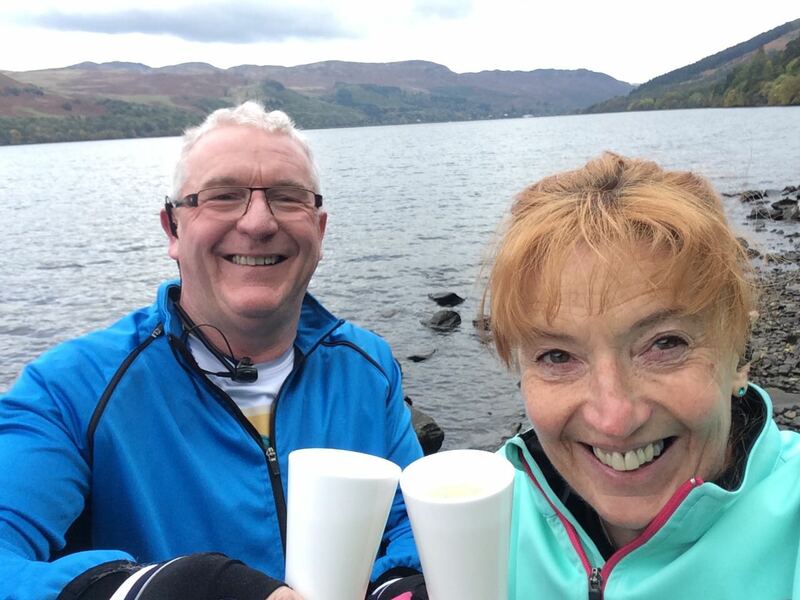 The brainchild of LETi, the local Loch Earn Tourism Information group, the trail is also designed to encourage more visitors to the area – to boost tourism and the local economy. And it certainly worked – in as much it was the added factor to persuade Team Matilda to make a visit. So I was packed in Matilda Transport and the (infamous) prosecco picnic was packed and off we headed to the scenic village of St Fillans at the top of the loch on the eastern edge of Perthshire. As we parked the car the weather was just starting to dry up – and the “old git’s” research had unearthed an ideal spot for good coffee (and parking) at the St Fillans Village Store. Great coffee stop! 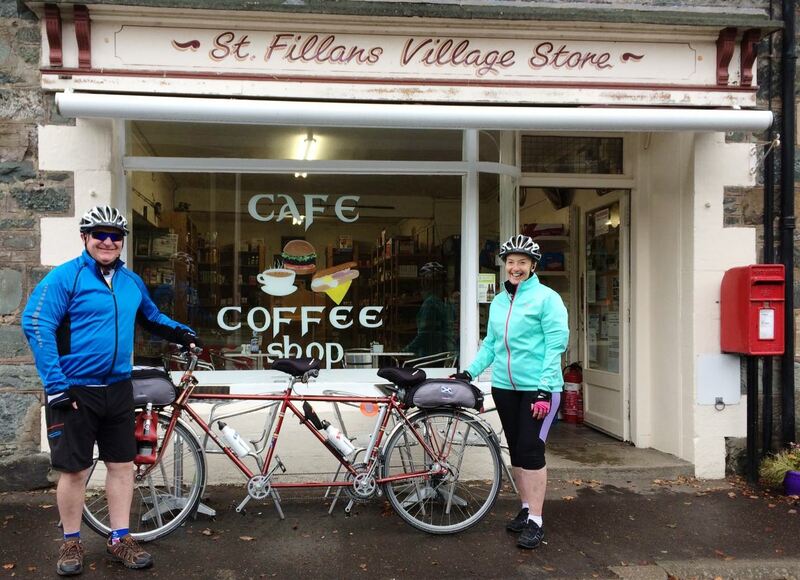 All 3 of us were made welcome at the St Fillans Village Store. It was as good and as friendly as all the recommendations and reviews suggested. And the warmth of the welcome – and the strength of the coffee! – certainly helped heat all three of us up before we started off on our loop in temperatures which were barely touching 6 C.
You can check out the details of our scenic route on the loop round Loch Earn from St Fillans on Strava below – and don’t forget to click on the map image to get the full date and statistics! Now Loch Earn itself is a freshwater loch and the name is thought to derive from “Loch of Ireland” – from a time when the Gaels were expanding their kingdom eastwards. The loch is the source of the River Earn which starts at St Fillans. As we tandemed away from St Fillans the “old gal” was heard to exclaim: “It’s Baltic!” To which the “old git” retorted: “No, its Loch Earn!” Oh how he laughed! 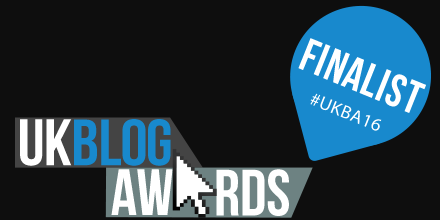 Lets just say that what was said in the ear piece of his walkie talkie by the “old gal” in response cannot be repeated in a family friendly blog! 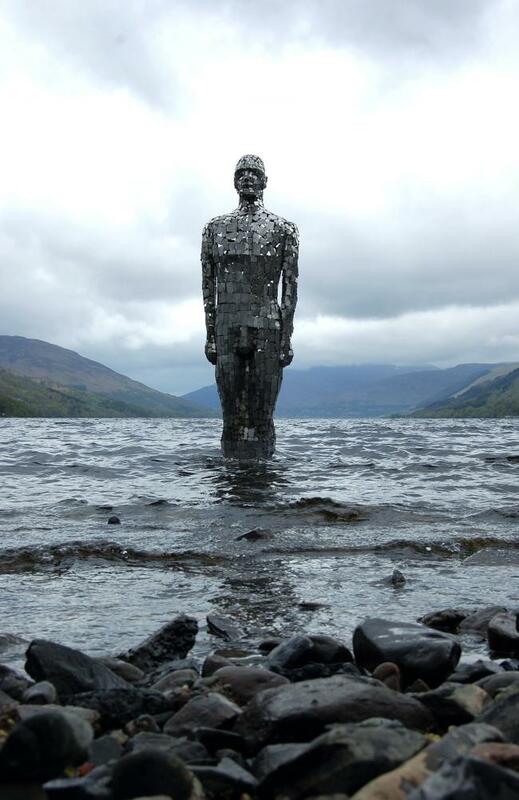 Still – Loch Earn’s mirror man sculpture at St Fillans. Although we were only doing the loop of the loch – from St Fillans to Lochearnhead – we were promised that there were plenty of other art installations on the BLiSS Trail to look out for. But unfortunately the most photographed one at the start – the iconic Bliss – wasn’t there! 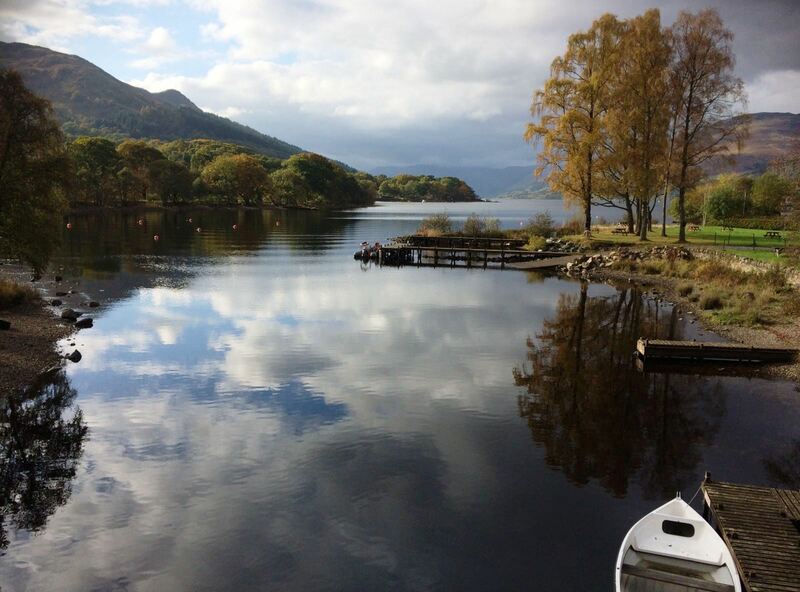 You see Bliss – more affectionately known as Loch Earn’s mirror man was nowhere to be seen as he had been removed for the winter season from his position lookout standing in the loch just by the jetty at the Four Seasons Hotel. The larger than life sculpture – by Rob Mullholland – was feared to have been destroyed in 90 mph winds last January which knocked him from his perch. But the half-tonne statue was recovered and underwent substantial repairs – including re-attaching his head (which sounds painful to me being another iconic metal structure!) He returned to the water in June but has been put into hibernation to avoid a repeat this winter. Fish out of Water – I could have told the fortune-telling fish that Loch Earn looked a tad chilly! Let’s just say that I could have told this fortune-telling fish that Loch Earn looked just a wee bit chilly today! So off we pedalled down the main A85 road towards Lochearnhead. Since this could be a busy road, the “old gal” ensured Team Matilda could be seen with her flashing red light on the back of her helmet and my very trendy hi-vis flashing light attached to my lollipop which ensures cars have to give us room when they pass. My dynamic duo soon got into sync and struck up a good pace and we whizzed along the side of the loch – probably in an attempt to keep warm! We were going so fast that we nearly missed two more of the sculptures nestling in the gardens of the beautiful thatched Briar Cottages. The first was the impressive Stan the Stag who looks out over the loch like a stunning Monarch of the Glen. The “old git” pretending he is a rutting stag – with me at the artwork at Briar Cottage garden. The stag structure is an incredibly detailed sculpture by Kev Paxton – and is made of steel flowers, leaves and a thistle. Over 500 hours went in to making it. And, as the “old git” and “old gal” did, if you peep inside its flowery body you will find treasure; a humming bird drinking from its heart, a butterfly and a cute-as-anything mouse with a block of cheese! After making my acquaintance with Stan we then moved a few yards – within the same garden – to see Blawn wi the Wind – a sculpture of giant thistles, which has also been created by Kev Paxton. Two metal structures together – me and the giant thistle artwork. 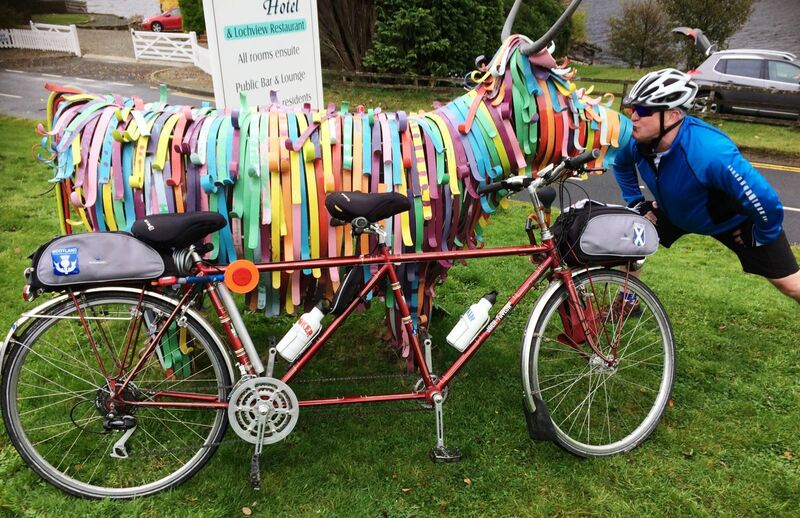 A quick pedal on and Team Matilda turned into the Lochearnhead Hotel where we met Bill the Bull – a colourful take on a Highland coo or bull to be exact! In fact Bill the Bull is described on the BLiSS Trail notes as being a “psychedelic party animal who hates to miss out on anything fun!” So naturally the “old git” had to see if he lived up to his reputation! Bill the Bull and the “old git” getting friendly while I watch on at the Lochearnhead Hotel. We tandemed on and arrived at Lochearnhead at the western end of the loch, which is a popular centre for fishing and a wide range of water sports including sailing, water-skiing, wake-boarding and canoeing. 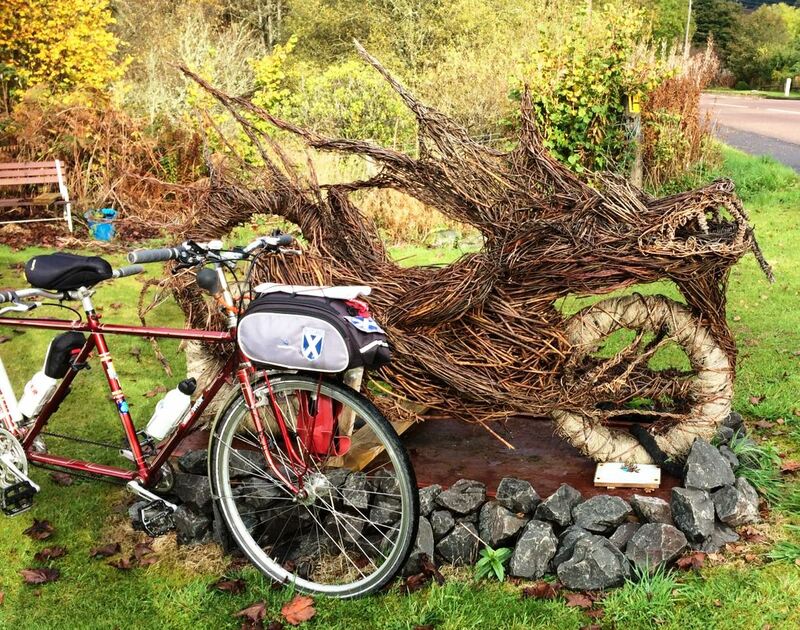 Continuing our tandem in an anti clockwise direction we turned on to the A84 briefly to take in our final artwork called Dragon Bike – made out of wicker by artist June McEwan. 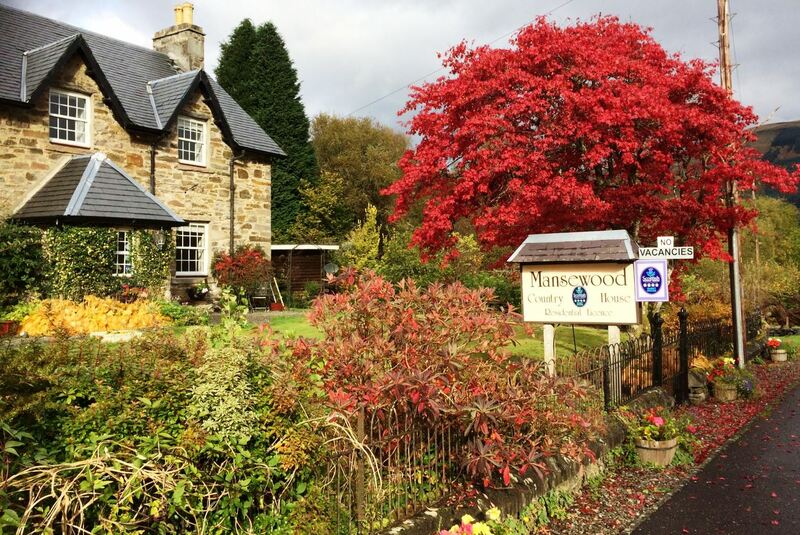 It sits proudly outside the Mansewood Country House which is a popular stop off point for motorcyclists. The Dragon Bike willow sculpture – and me – at Mansewood Country House at Lochearnhead. The Autumn colours were quite spectacular on our travels, none more so than as we rounded the end of Loch Earn to be met with what seemed like a vivid red tree. Amazing Autumn colours on show at Lochearnhead, half way round our Loch Earn loop. My dynamic duo then continued our loop by turning left along the much quieter single track South Loch Earn Road – complete with passing places. This is actually part of Sustrans Scotland Route 7 and is quite undulating to begin with with a couple of fairly steep hills, which I am pleased to report my dynamic crew conquered due to their new found fitness. Edinample Castle- with my friend Bluebird.. The first of many points of interest on the narrower road was the spectacular Edinample Castle – which is now a private family home. The castle has quite a history – originally built by ‘Black’ Duncan Campbell of Glenorchy. It is built on land acquired by the Campbells after their campaign for proscription and subsequent demise of the MacGregors. It is said that Black Duncan pushed the castle’s builder off the roof, in part to avoid paying him, but also because he omitted to construct the ramparts that had been requested. It is also said that the ghost of the builder has been seen walking on the roof. 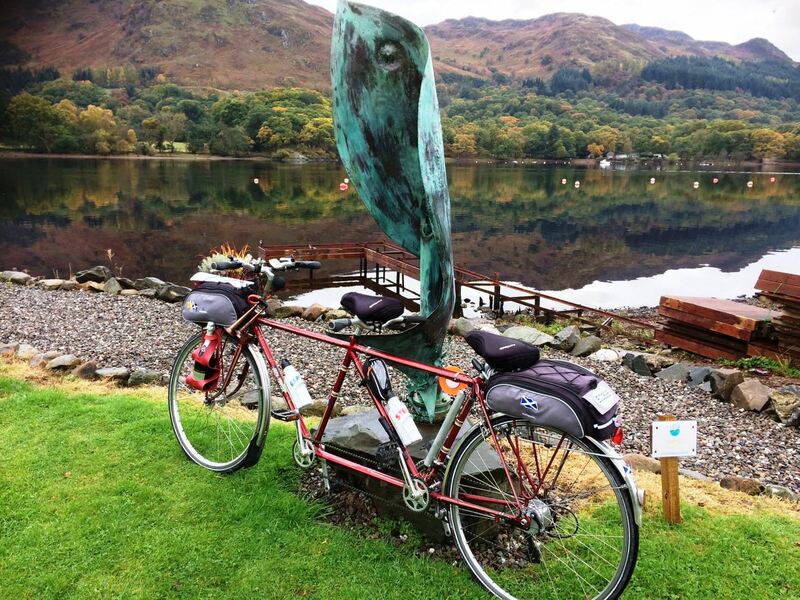 The “old git” was so intent on keeping up the momentum for the next incline that he forgot to stop here so I have borrowed a photo showing my pal Bluebird – and her crew – from their trip around Loch Earn during our recent Tour de Perthshire. A mile or so on, on a less undulating section, there was time for a selfie – though quite why the “old git” always throws his head back as if wont get in the shot beats me, and the “old gal”! Selfie time on the south side of the loch – the “old gal” does look cold! The “old git” at the ancient wood. Whisper it but he decided it was a tad foolhardy to wear shorts! 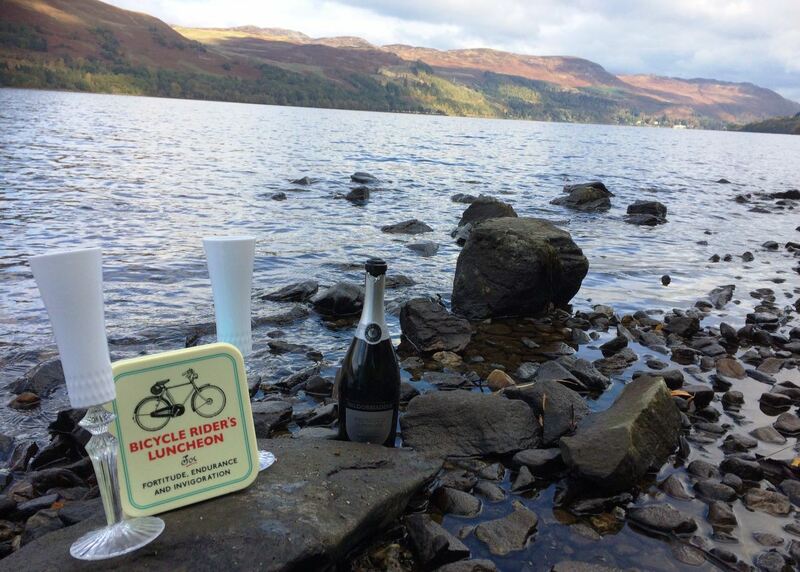 About three quarters of the way round Team Matilda found a perfect isolated spot for their (infamous) prosecco picnic – right on the banks of the loch with a fabulous view up and down the water. Cheers! The prosecco picnic on the loch side was a welcome distraction from the cold! My dynamic duo were feeling the cold a bit by now as the “old gal” in her (not very) infinite wisdom had decreed that she and the “old git” wouldn’t need their thermal leggings today! She was wrong! So that’s a schoolboy error that won’t be repeated on future rides during the rest of the year! Although one good thing was that low temperature meant that the prosecco was nice and cool after being carried in my very fetching red leather la bouclee wine bottle carrier – which of course matches my frame! Tandem riders lunch box – for fortitude, endurance, invigoration …. and prosecco! The water of Loch Earn was very calm today but the “old git” couldn’t resist recounting the interesting fact that Loch Earn is one very few freshwater bodies of water that has its own seiche – a tidal system which is caused by the action of the prevailing wind blowing along the loch. This wind pressure on the surface causes the water level to build up at one end of the loch. This in turn results in oscillation and the water will return to the opposite end of the loch over time. In the case of Loch Earn, this takes around 16 hours and although the effect can be measured, it is difficult to observe. But the resulting currents can create complex turbulence patterns, as higher layers of warmer waters mix with the lower lying colder waters of the loch. Loch Earn is fairly unique in this – and is illustrious company of a few other bodies of fresh water which experience this seiche effect including the Great Lakes, Lake Garda, and Lake Geneva. You can see what the “old gal” thought of that piece of information in the cheeky selfie pic below! Never takes your eyes off your stoker! The cold temperature led the “old gal” to pull a funny face! 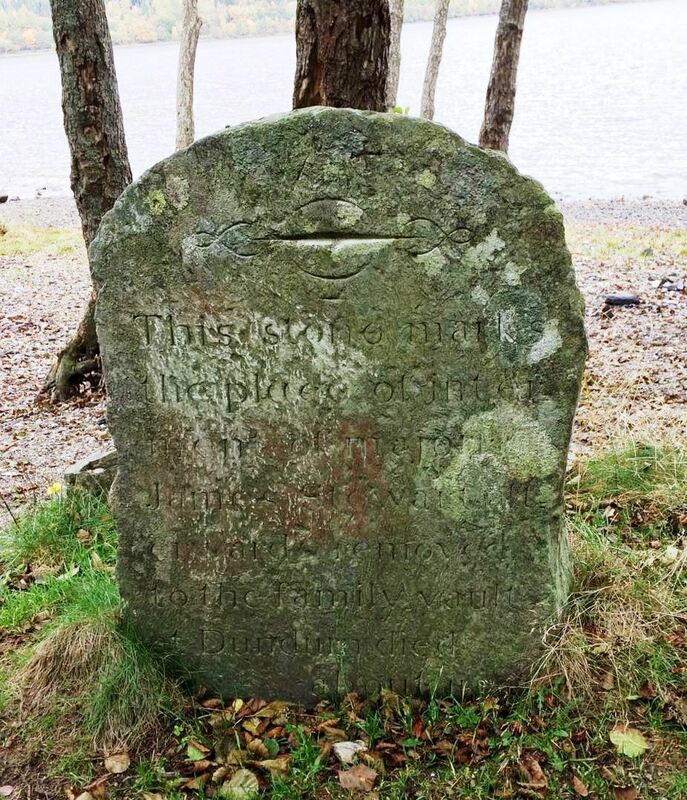 The old gravestone dates from 1660. It seems the chief of the Clan Stewart had made many enemies, but always managed to avoid them. He died peacefully in bed but his enemies – possibly Grahams or MacGregors – heard of his death and, furious at having been cheated of their revenge, swore to desecrate his body on its way to burial at St Fillans. The funeral procession, having left the Stewart home at Ardvorlich house further down the road were forewarned and buried their chief in a shallow grave down the hillside close to the loch where he was left for several years until more peaceful times. He was then dug up to be safely buried in the proper place at Dundurn, burial place of the chiefs of the Clan Stewart. The gravestone marks the spot where his body was hidden. So now you know! Over an old bridge and we rejoined the main A85 for a short sprint back into to St Fillans to complete the route. The sun had decided it would make a belated appearance at this point which allowed my crew the perfect opportunity to take a few more pictures. Team Matilda after completing the Loch Earn Loop on the bridge over the River Earn. A beautiful picture postcard shot looking down Loch Earn from the bridge at St Fillans. Then the “old git” had to get in on the act and while the “old gal” was happily snapping away, he led me down a steep grass banking and on to a slippy wooden jetty out onto the loch! I thought we were going to fall in at one point! Lets just say that precariously reversing back off the jetty was interesting. The “old gal” couldn’t look! Though she was heard to shout: “If you fall in I’m not coming in after you – its too cold!” But I am sure she was joking! The “old git” and me precariously balanced on a slippy jetty on the loch. Anyway we safely negotiated our return to terra firma and Team Matilda returned to the St Fillans Village Store for a reviving coffee in its cosy cafe area. This allowed my crew to have a look at Strava which officially recorded the ride as covering a distance of 15.8 miles with a total moving time of 1 hour 29 minutes, at an average speed of 10.6 mph. Total elapsed time was just 2 hours 16 minutes due to not hanging about during the picnic! Top speed was 24.4 mph and the elevation covered was 714 feet. We managed to burn up 1,315 calories and produced an estimated average power output of 219 W.
After body temperatures returned to normal I was packed back into Matilda Transport and we took our leave of a beautiful area – with Team Matilda vowing to return. 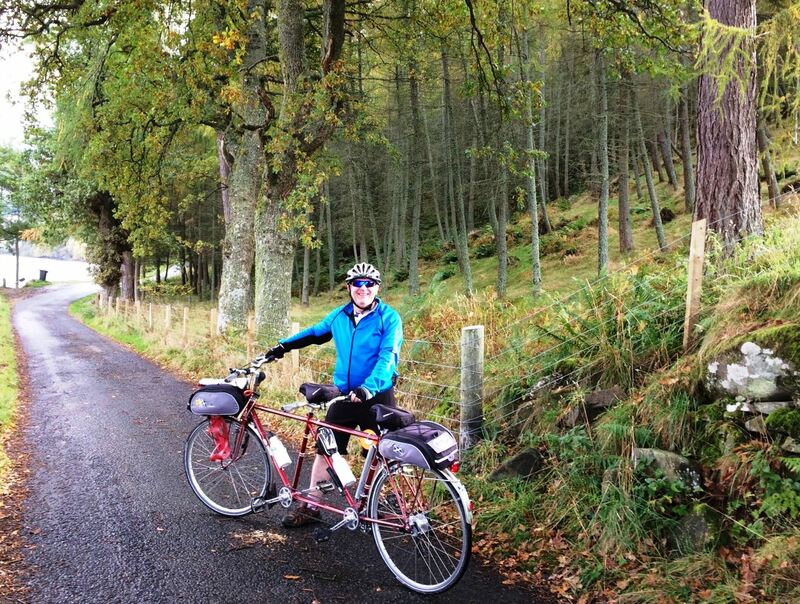 On return to Matildas Rest – and after I was safely returned to my warm garage – the “old git” put our Strava route around Loch Earn and some pictures of me enjoying the BLiSS Trail on social media. 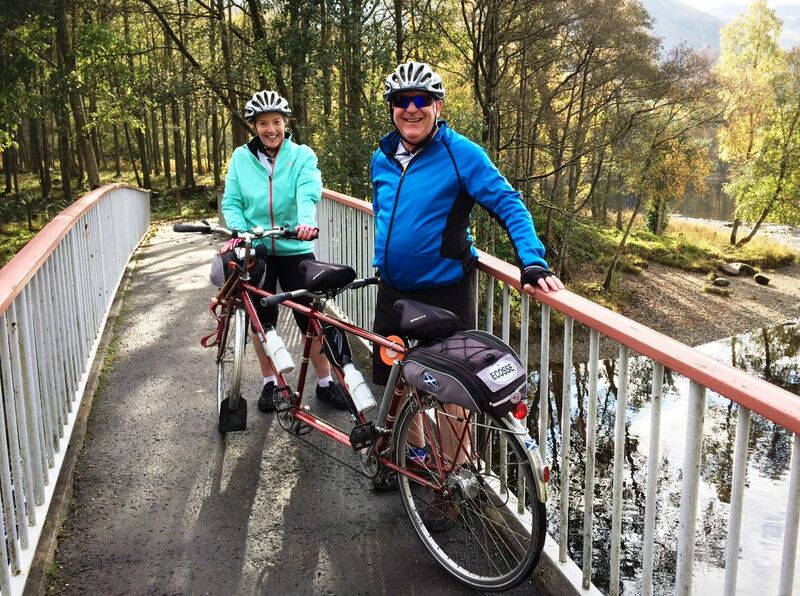 Interestingly my notoriety as a tandem who writes her own blog was almost immediately recognised in a series of tweets from the area including the Rob Roy Country tourist body and Kim Proven, the chair of Leti, the Loch Earn Tourism Information Group. So fame indeed! And – according to the tweets – it seems Team Matilda may in fact be invited back soon on a return visit to the Loch Earn area so I can be guided to the other areas of Balquidder and Strathyre. NEWS UPDATE on BLiSS Trail! 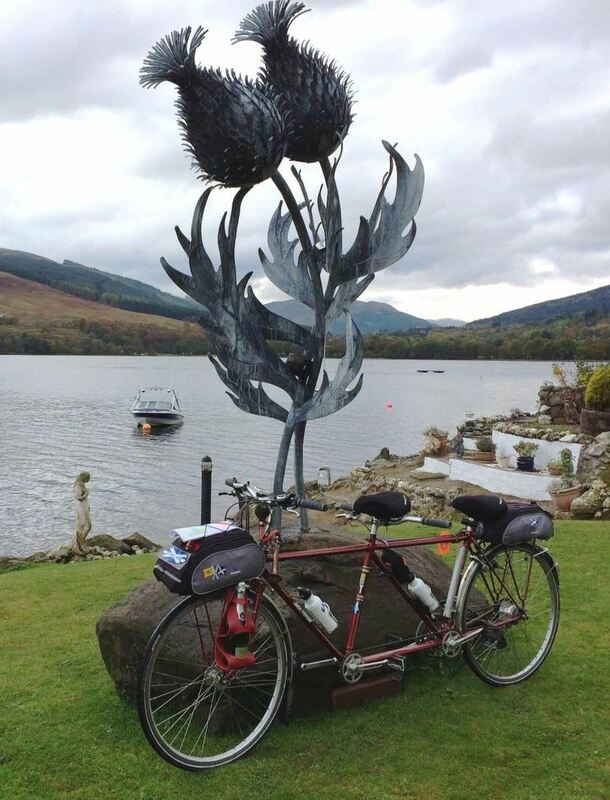 On November 10, LETi – The Loch Earn Tourism Information group, which organised The BLiSS trail of art installations – won the regional Central, Tayside and Fife trophy at Visit Scotland’s Scottish Thistle Awards, for “Working Together for Tourism.” Congratulations! Sounds like a brilliant day out. Probably a much better time of year to cycle along that part of the usually busy A85. I love the multi coloured bull, he’s rather beautiful and have admired him several times this summer from our coo-van. Autumn is one of my favourite seasons and I imagine travelling around at this time of year was really spectacular. Mel thanks for your comments. It was a grand day out for Team Matilda – although a tad on the chilly side without the thermals! But for my dynamic duo travelling by tandem certainly brings them much closer to nature! And we are already planning return visit to see Balquidder and Strathyre … and of course going back again to see Mirror Man in all his shiny glory! Hi there Matty. Glad to see you are exploring my old haunting ground. I have spent many “happy” hours around Lochearn! Need I say more? That’s why I look 10 years older than I am ! I see you were getting friendly with the Dragon Bike . Very nice indeed. You could do a lot worse. I think the old dears bought the White Prosecco glasses to try and trick people into believing they are drinking milk! No chance ! Oh Dot you are wicked! There was me thinking that “happy” hours indeed meant happy hours – as opposed to “happy” hours! And ten years older – you will almost be as old as me then! Milk? No chance! You see (I am told) my dynamic crew need the prosecco for re-hydration purposes! An excellent read Matilda, you have outdone yourself. So many very interesting facts, live and learn as they say. Bluebird was very chuffed that you included her photo in your blog and really hopes she can show you her special area next year. Good luck on the tweeting. Hello Jane and Bluebird of course! I knew Bluebird wouldn’t mind using her picture! You see my crew forgot to take one – and you just can’t get the staff! After all it was Team Bluebird who pointed out this fantastic route which is virtually on their doorstep … or within half an hour or so. And I have to say my dynamic crew mentioned to me the prospect of a tour de New Forest … so am sure we can make it happen! I like tandeming thru tree tunnels as you can see from many of my pictures! Excellent article Colin. Matilda has a keen eye for photographing fashionable art trails and got you around Loch Earn in one piece in spite of the chilly day. Since Matilda visited, LETi -The Loch Earn Tourism Information group who organised The BLiSS trail of art installations – has won the Central, Tayside and Fife trophy at Visit Scotland’s Scottish Thistle Awards, for “Working Together for Tourism” We would like to invite you back soon to do the Balquhidder leg, followed by the Strathyre leg if Matilda can stand whatever weather might occur in the next month or two. Would be lovely to see the trail in snow. Do they make winter tyres for hard working tandems too or just cars? Will be in touch. Kim, this “old lady” would like to offer my sincere congratulations to winning the regional Scottish Thistle Award for your marvelous BLiSS art trail. I found it truly inspirational and was interesting to see some other iconic steel structures. As you know my dynamic crew are partial to some fashionable culture as they tandem (as well as being partial to some prosecco!) 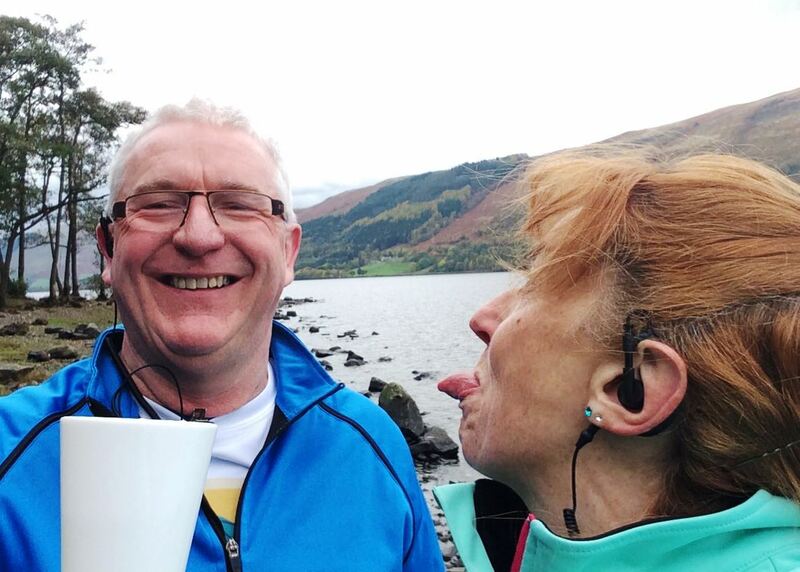 so it was perfect for them – if a tad chillier than the had expected for October, reflected in the title of the blog post … BLiSSful but Baltic Loch Earn Loop. Thanks for your praise about my keen eye for a good photo – although I have to credit the “old gal” with some of the shots as she is quite good at it as well! Now because I am a classic tandem – of a certain vintage – I am made of stronger stuff than some of those new flimsy carbon-style lightweight bikes and tandems so weather is no problem to me. My crew may say differently, but I am an “old lady” who is an outdoors girl and up for fun in any weather in fantastic scenery like surrounds Loch Earn! 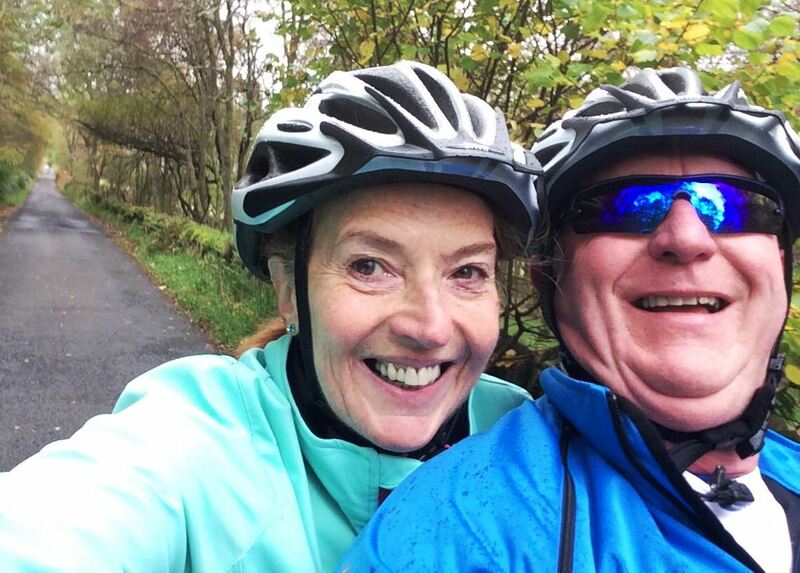 The “old git” and the “old gal” just need to wear the correct outdoor gear (whisper it, but including their cycling thermals) if the weather is slightly inclement or cold! And as for snow – as long as not too deep I am sure Team Matilda could manage! I draw the lines at snow chains however! So yes me and my dynamic crew would love to accept your invitation to see the Balquidder and Strathyre legs of the trail. 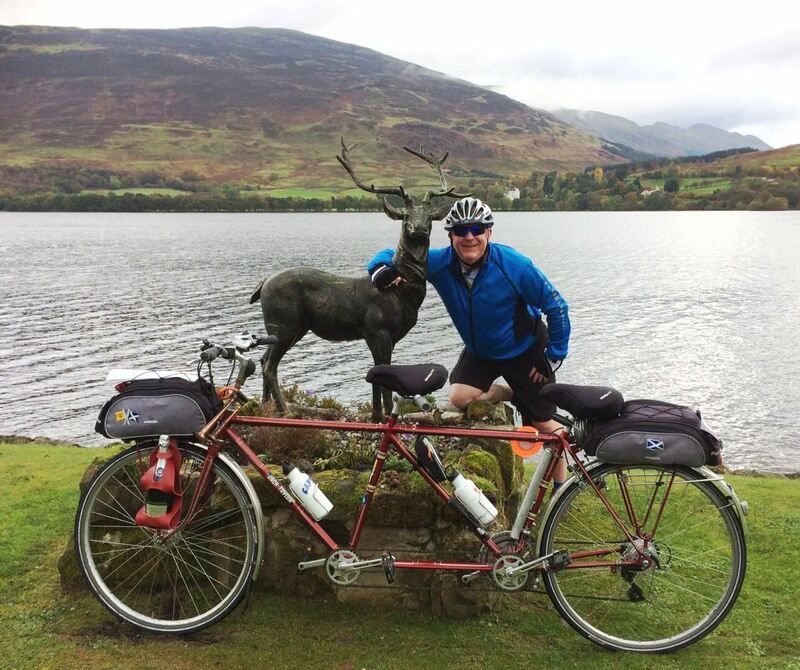 We hope you will be in touch soon Kim and I can feel the wonderful Loch Earn fresh air between my spokes again! And hopefully we will get to meet up so I can feature a picture of you beside my tandem frame! If you’re lucky you may even get a shot at being stoker!